Circling with The Goddesses : Together we Circle with the Goddesses exploring their gifts as well as ways to bring more of their energy into our own lives. This will be free form, heart led exploration, with each of us coming to our own wisdom. This is an invitation to explore and dialogue with the Goddesses, the course is merely the container for us all to open up to our own lessons. I will be right there in circle with you.. These courses are gentle medicine where you get to choose how you show up to this work. These previous live sessions are now being offered up as self paced offerings. Each session contains the magic of the live session, as the circle exists outside of both time and space, while allowing you to dive deeply with each goddess, taking your sweet delicious time, devouring it all in complete immersion or lingering in their embrace. Details for each session can be found below. For more information on each session scroll down. All self paced sessions are $45 ea. I cracked open today in yoga class. we both know that kind of opening doesn’t happen if you try “force” or make happen. I was so grateful to find the space and openness to let go. this kind of Release and just be with my pain and emotion. 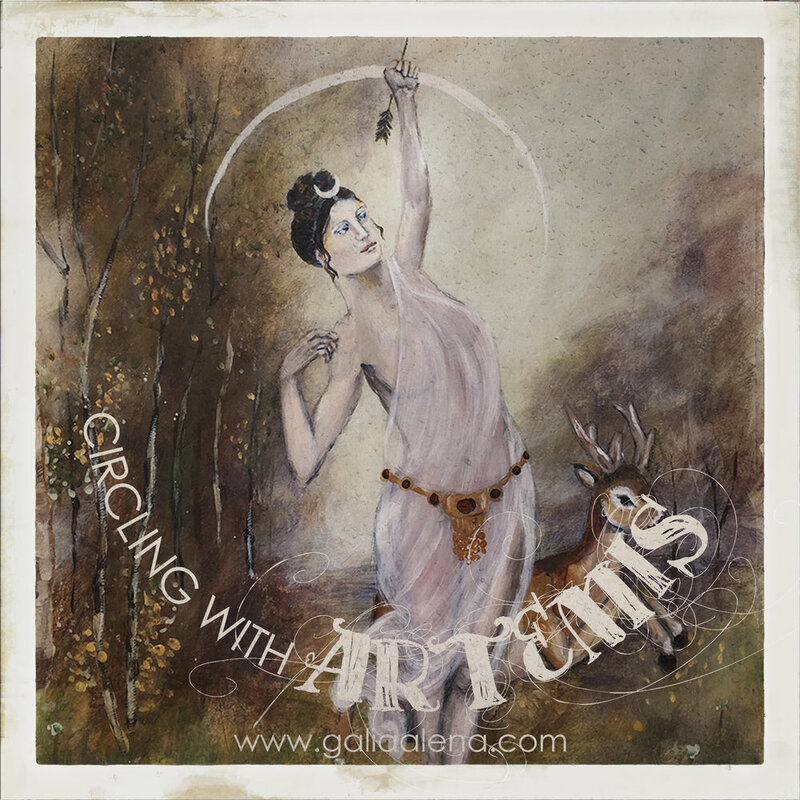 Goddess of the Hunt & the Moon, protectress, Artemis is wild and independent with deep connections to the natural world and to her sisterhood. Virgin Goddess, she is unto herself, soul untouched, independent, self-sufficient and wild. She lives outside of societies proscribed place for women and follows her own truths and will. Cerridwen is a Celtic Welsh Goddess- Keeper of the Cauldron of Memory, Transformation & Inspiration. She is one who conjures, draws down the moon, shape shifts and creates magic. Her cauldron can be seen as a metaphor for the womb or yoni, source and power of so much. She is seen as the Crone aspect of the Triple Goddess, yet is also the mother aspect and the often forgotten fourth aspect- Queen. Saraswati has been walking with me since I meet her in Bali many years ago. She is the Goddess of Flow, Inspiration, Sound, Truth and Wisdom. We'll be diving deep with mantra, sound, inspiration, hacking the flow, the muses, language, manifestation, the power of words, inner wisdom and speaking our truth. There is just so much to learn from Saraswati's gifts, she is the power behind creation. We will be exploring the many gifts of Lakshmi, opening ourselves to the beauty and abundance of life, that which is all around, that which we call in, that which we create, that which we give freely. Bhuvaneshwari is the Mother of all Mothers, Great Mother, Cosmic Yoni- she births the world that she is. She is the space between thoughts, the pause between breaths and the silence between the notes, she is also, of course, the thoughts, the breaths and the music itself. Spring. Underestimated and over looked, dismissed as victim, child, pawn in the stories of others yet she is one who moves effortlessly between worlds, and dances in both the light and the shadow. She embodies the movements of life and death with such grace and isn’t scared to shadow mine. Dark feminine goddess, Goddess of Transformation, her gifts are as bountiful as the Spring she heralds. We will be exploring the many gifts of Persephone, diving deep and meeting parts of ourselves and embodying her wisdom and power. She's been calling to me, whispering "rest, rest your weary heart, I've got you, I've always had you", I see petals, roses, I see soft light, I feel warmth and tenderness. She is Fierce Gentleness. She is mama ocean of eternal love. This is what I need, what I’m yearning for, and, I'm trusting, perhaps you are yearningn it too. ♥ A release, a laying it all down, the weight of it given over. Do you know this? Will you allow this this? Kuan Yin is the mother of compassion, of love and grace. She is the one who hears all the cries of the world and sweeps them up in her loving, all encompassing and expansive arms. No, these self paced courses are available for anyone who wishes to dialogue with the Divine Feminine who dwells within us all. Is this virtual or in-person? This is virtual and online. You can access the workshop anytime from anyplace with a good internet connection. You don’t need to be on Facebook to do the class- these sessions are not the live sessions where we gathered together to do the work together but are self paced and don't have the Facebook support. However, the circle exists beyond time and space so you will still be embraced by the collective energy of the circle. How long will I be able to access the workshop? The workshop are accessible for a minimum of six months after the session begins. Sorry, but all sales are final, once you have signed up there are no refunds for these courses, Please be ready to dive deeply with the Goddesses and the community of sisters we shall create doing some beautiful and transformational work. What happens after I purchase the workshop? You will be redirected back to my site to complete your registration and then you should automatically receive an email with access to the classroom (you may wish to add my email address to your contacts to help with any spam filters- if you haven't received an email after 24 hours and can't find it in either your spam junk or promotional folders please contact me for assistance). Please be ready to do some beautiful and deep work.